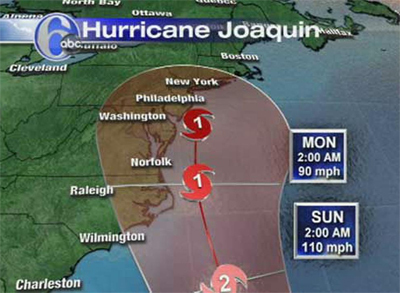 Washington DC » Blog » Disasters » Tips for Before, During, and After a Flood in Washington D.C.
Hurricane Joaquin gained strength on Thursday off the U.S. coastline, reaching Category 4 status over the Bahamas. While there is speculation as to whether the bulk of the storm will make landfall or not, there will still be heavy rainfall and flooding in Washington D.C. and surrounding areas. Joaquin is projected to reach the southeast coast this weekend, peaking late on Saturday through early Sunday morning, with forecasts projecting heavy rain, strong winds, and flash flooding. Governors Larry Hogan and Terry McAuliffe of Maryland and Virginia, respectively, both declared a state of emergency. “While we are hoping for the best, we are preparing for the worst.” Said Hogan at a press conference on Thursday. The Red Cross National Capital Region is your go-to resource for all things emergency and disaster relief related in your area. They’ve got resources to plan & prepare for a disaster, including information for children. You can also get emergency alerts through AlertDC. In addition to protecting yourself and your family, make sure to take care of your pets. If your pet remains with you, bring enough food to last through the emergency and remember any pet medications as well. If you need a safe place for your pet, contact the Washington Humane Society. Additionally, both the Red Cross and the ASPCA has great disaster preparedness information for pets. Call the Red Cross Emergency Response at (703) 584-8400, or the Washington D.C. Homeland Security and Emergency Management Agency at (202) 727-6161 for emergency relief. Experiencing a severe weather event like a hurricane is a traumatic experience but sometimes, the aftermath is just as stressful. After a storm and specifically a flood the focus shifts to recovery and restoration efforts, which 911 Restoration of Washington D.C. can help with. Let 911 Restoration of Washington D.C. be the calm after the storm. For a fresh start in your home or business, give one of our flood experts a call at (202) 350-2244 today.